Netball court facilities can be designed and installed to meet a wide range of different specifications and surface types. The area sizes and netball court dimensions can also be altered to fit the space each school or club has available and to ensure you get the best facility for your budget. If you are interested in having a facility like this built, don’t hesitate to get in touch with our team for more information. We will respond as quickly as possible to help with your enquiry and offer an idea of costs. Typically, most British netball associations outline netball court dimensions as 30.5m x 15.25m for a standard sized court, however if the court is being used just for recreational purposes the surface size can change. There are also five different categories of netball court dimensions and surface types which range from outdoor multi use courts to indoor courts built specifically for netball. Each category of netball court surfacing has different qualities which may be better suited to different requirements, so it’s important to do your research and make the right choice for your organisation. Fencing and floodlighting can also be installed to suit the specified netball court dimensions that you choose for your facility, so you can be sure that your sports surface will remain safe and can be used as much as possible even in non daylight hours. 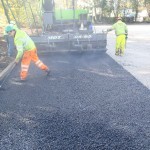 Macadam Type 2 MUGA Surfacing – This is made up of porous macadam surfacing laid onto a dynamic stone sub base. 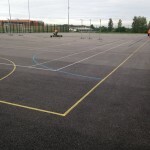 The macadam sports court surface can then be painted with an acrylic anti slip coating and line markings to create the ideal slip resistance qualities for netball. 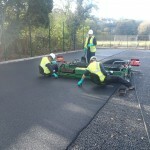 Polymeric Type 3 MUGA – This is made of polymeric EPDM rubber crumb particles which are combined together with a binder, this mixture this then poured out onto an engineered macadam sub base. Polymeric surfacing will then have a polyurethane non slip paint coating applied to give the required slip resistance characteristics for netball. Both of these durable and versatile sports court surfaces can be installed in different netball court dimensions and can also be effectively utilised for playing multiple sports including basketball and tennis. Extra line markings can be applied in contrasting coloured non slip paint to make playing and scoring with different activities simple and accurate. It is our aim to offer all of our clients a unique service which meets their requirements and budget and also gives them an end product to be proud of. We can be flexible on all of our specifications and prices to ensure you get the best value for money for your individual sports surfacing installation project. If you’re in need of any further help or advice in regards to netball court dimensions, or you’d like to discuss pricing and quotes for any of our other sports facility services, please don’t hesitate to use your contact form to get in touch with us. One of our experienced team members will be happy to answer any questions you have and offer you professional advice regarding your enquiry.